From Polar Plunges, to Monster Trucks, to King Neptune, the Virginia Beach Events never stop. She-crab soup festivals. Sand-castle contests. Flotillas of historic tall ships. Caribbean music festivals. Whale-watching. Drive-thru holiday light shows (the only time of the year when you can drive your car on the boardwalk!). There always seems to be something going on at the Beach, whether it's winter, spring, summer, or fall. 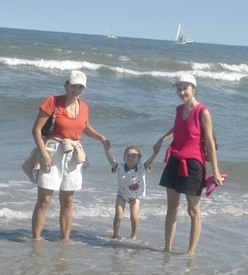 And many of the events are free and just steps away from the beachfront hotels and restaurants. Here are just a few of the special events and festivals that make the Beach such a wonderful place to visit! Great photo ops along the Virginia Beach Boardwalk. 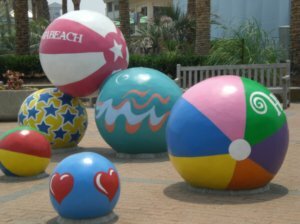 Just click the links below for my favorite Virginia Beach events (plus events for nearby cities and attractions in Virginia) by season. Finding deals and saving money takes time, but why travel or have fun in Virginia for more than you have to? There's no reason you have to pay full price for that Busch Gardens Williamsburg or Kings Dominion ticket. And there's no reason you have to spend hundreds visiting expensive attractions when there are so many fun and cheap things to do (and ways to see even attractions like Colonial Williamsburg for free!). I've done the bargain-finding leg work for you! How to eat in great restaurants for less! Alex at his first visit to Virginia Beach for the Neptune Festival. Can't decide where to go or what to do? My Attractions page (see the link at the bottom of the page) is chock-full of my personally-reviewed attractions that will give you the best bang for your buck, from aquariums like Virginia Aquarium, to amusement parks like Busch Gardens, Kings Dominion, Water Country USA, and Great Wolf Lodge Williamsburg, to presidents' homes like Monticello, Montpelier, and Ashlawn-Highland. I'll give you all you need to know to plan your trip (admission info, hours, insider's tips) plus how to get discount tickets. To get started, check out my Virginia Attractions page.